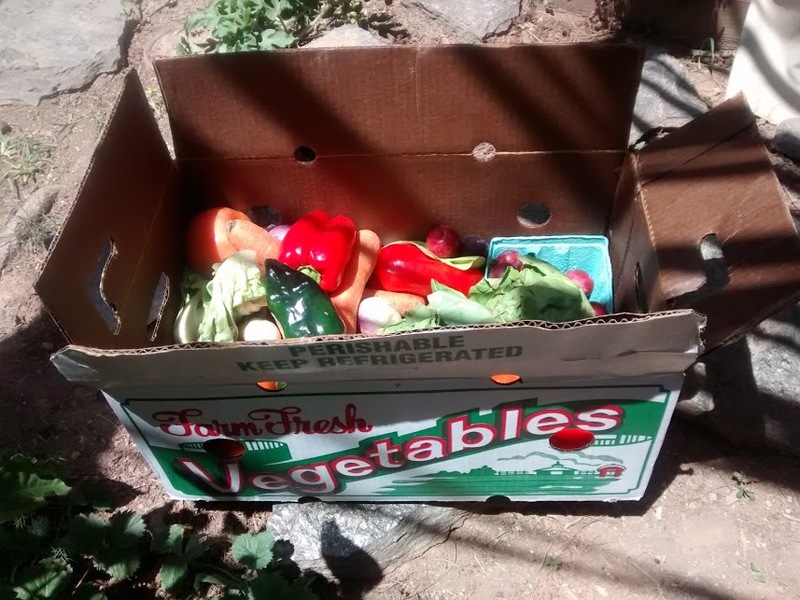 Last year I was VERY faithful about sending out a weekly email to all the CSA subscribers about what was in their box and how to use it or different recipes using their weekly ingredients. Here we are 6 weeks in and this is the first post/email about what our boxes contain! But… it’s a good thing. Over the last seven months I’ve had the rug pulled out from under me and it took me a long time to slowly get back to my normal activity level. I really didn’t have the motivation to do much of anything. That has since mostly returned, but I definitely don’t have the desire to be quite so busy as I was in the past. We still have a crazy amount of things on our plates, but I feel like I’m doing a better job of saying no, slowing down and taking a nap if I want one, reading a book with the littles, rocking the ‘baby’ (almost 2 year old), and trying to make the most of each day and enjoy it for what it holds. So the emails I was faithful to send last year and the two to three weekly posts on the blog have been slowed. I don’t stress about it and post when I feel like there is something to say or something I want to share! We find ourselves well into summer with yummy veggies and fruits gracing our tables and filling our bellies. Here is what’s in the boxes this week and some ideas of what I may do with it this week! Tomatoes – Never a hard time using these! Perfect for summer burgers or salmon burgers. Lovely to make pico de gallo or fresh salsa, and delicious with basil and a sprinkling with balsamic vinegar. A summer salad favorite of ours is a Mediterranean Pepper Salad which is a tried and true around here! Turnips – I’m not usually a fan of root veggies like turnips and radishes… but I fermented the radishes a few weeks back and I think I’m going to do the same with these. It took out the peppery flavor and made them much more mild but still crunchy. I found this lacto-fermented recipe for the turnips and am going to give it a go! Poblano peppers – These peppers are a quite spicy if raw, but if roasted take on a bite, but it lessens and the roasted pepper flavor is delicious! I make a sweet and spicy salsa for homemade chicken nuggets which is super yummy! Roast the peppers, peel them, puree with fresh pineapple. Then simmer until thick. Delicious! It’s a recipe from Paleo Parent’s Eat Like a Dinosaur cookbook, but I found the recipe here. Red peppers – These we tend to eat raw as a side for lunches or with some hummus. I do add them to the Mediterranean Salad and fresh salsas. These usually aren’t too hard to use! Bok choy – We JUST ate this on Sunday night! One of our favorite meals is my Sweet and Spicy Asian Pork Shoulder recipe . It’s super simple crockpot recipe that doesn’t taste like your typical roast! I add the bok choy at the end! Delish! Lettuce – Another veggie that we are all very used to. Caesar salad has been a new fave with homemade gluten free croutons and my own recipe for our Caesar dressing! It’s never met with sad faced. ALL are happy to have salad on these nights! We also really enjoy chicken lettuce wraps as well! Carrots – Another raw addition to our typical lunches! Also good afternoon snacks. One of my fondest memories I share with my Dad is eating raw carrots together with a generous sprinkling of salt on them! My mom would never add the salt, but Dad and I LOVED them that way! I should introduce my kids to them!!! A favorite this past winter was roasted carrots with olive oil (or butter if you can have it) and a generous sprinkling of dried dill. FANTASTIC!!! So there you have it! Our week in veggies! Enjoy! And feel free to share recipes that you enjoy as well! It’s always good to have new ideas! Next Will We Have a Second Rainbow Baby?